The death of three sisters due to starvation shook Delhi last month. Mansi, 8, Paro, 5, and Sukho, 2, were found unconscious in a pool of vomit. They were brought dead to hospital and the post mortem revealed that they died of starvation. It is appalling that the capital city has been struggling to tackle malnutrition among children despite the many endeavours by the government. According to NFHS 4 (National Family Health Survey), over 62 per cent children are anaemic in urban Delhi and that speaks volumes about the state of affairs regarding child health. Urban poverty is considerably different from rural poverty. The set of implementation challenges are different for rural and urban, and the focus has been mostly on rural schemes. The urban debacle has a versatile role that extends to other realms of child safety issues. Among all the contenders, ICDS (Integrated Child Development Scheme) would make for the most prominent case for its lackluster execution in the face of urban poverty. ICDS was borne out of a simple but powerful premise that good health of every mother and child is a non-negotiable factor for the government. Anganwadi centres are the carriers of the service provided by the ICDS to children and families. They were formed as an answer to rising child mortality and anaemia. By giving infants the required supplementary nutrition, the centres offer children one healthy meal a day, along with a few activities that initiate learning. The AWC workers also conduct regular health check-ups and immunisation for mothers and infants, and help identify malnourished children or anaemic pregnant women to be referred to medical officers. However, in urban areas, the functioning of AWCs has been riddled with challenges, starting from space constraints, lack of equipment to making home-visits for enrolling more children. In urban slums, where both parents work during the day, it is difficult for them to leave the children at the centre as it closes in the afternoon. Therefore, most children are either left at home in care of their siblings—a case of double jeopardy for both children, or under the care of others wherein the child's safety comes under scrutiny again. A possible solution may be found in the crèche services under ICDS as they operate for longer hours. Crèche could ensure that the children are in a safe and congenial environment while parents work. The need is to increase the coverage of crèche services and make them more accessible for families. According to Global Hunger Status (GHS 2017), India stands 100 out of 119 which directly points to the gravity of child malnutrition in the state. Infant mortality rate in urban Delhi stands at 35 (per 1000 live births, according to NFHS 4). Only 30 per cent children under the age of three are breastfed within one hour of birth, against a national average of 41 per cent. This is a telling fact on the lack of knowledge transfer to new mothers at the centres. 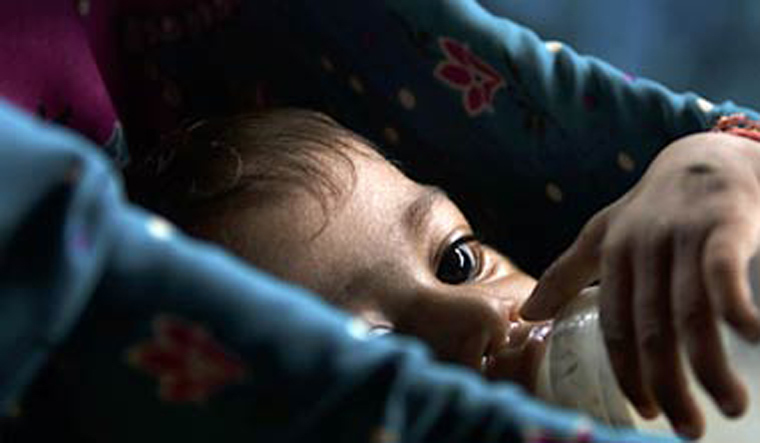 The rate of babies aged between six to 23 months, who receive adequate diet, adds up to a shocking 5.6 per cent (NFHS 4) in Delhi, and only 50 per cent of babies below six months are exclusively breastfed, which is lower than the national average of 55 per cent. These will have direct and dire impacts on the health of the child as she grows up, as is reflected in NFHS 4. The rate of children in urban spaces under the age of 5 is 27 per cent, while 32 per cent face stunted growth. One can also trace the health of the new born back to where it all started—to the mother. An expectant mother will likely have poor health indicators owing to the rapid changes her body is going through. Adding to that is the stark gender divide still prevalent in societies that reflect even in the eating habits of families rendering pregnant women rather undernourished. The AWC are required to take into account these factors and ensure the good health of an expectant mothers by keeping them informed and encouraging them to take health supplements. However, NFHS 4 states that only close to 40 per cent mothers received complete antenatal care in urban Delhi, and a mere 8 per cent received financial assistance under Janani Suraksha Yojana (JSY) for births delivered in an institution, pointing out that new mothers’ health deserves more attention in the capital city. Another dimension to the problem of urban malnourishment has to do with the migrant populace in Delhi. People migrate with their families from neighbouring states in search of jobs, especially the lower income groups. Most of them would have no identity cards with them which could deprive them of some of the facilities offered, like ration, school admission for children and so on. These resettlements are not marked and assessed by any governing body, so for the moving population it is a daunting task to shift from the fringes of the society to the inside, and avail the facilities that are by law their right to seek and demand. The first step in the form of a solution to these problems will be to build accountability; these are violations of both maternal and child rights that largely go unnoticed amid other issues. On one hand, there are talks of expanding the ICDS coverage while on the other hand AWCs are getting closed overlooking the fact that improving the facilities at the centres and tending to staff are imperative measures in tracking the growth and development of the child. Above all, an overarching obstacle, in the event of the recent child deaths, is the slow dissolution of the safety nets—of the self, system and society. Had there been active community support, these damages could have been averted. Empowering communities to look after themselves as well as others makes for one answer to many problems; the system has to also acknowledge that the health of any and every child shouldn’t be the last priority just because she doesn’t ask for it. Soha Moitra, the author of this article, is the Regional Director (North) at CRY – Child Rights and You.